It looks beautiful and soft .i only wish the stitches were not showing .but overall im happy with my purchase.It looks very unique and I actually ordered another one for my living room too. 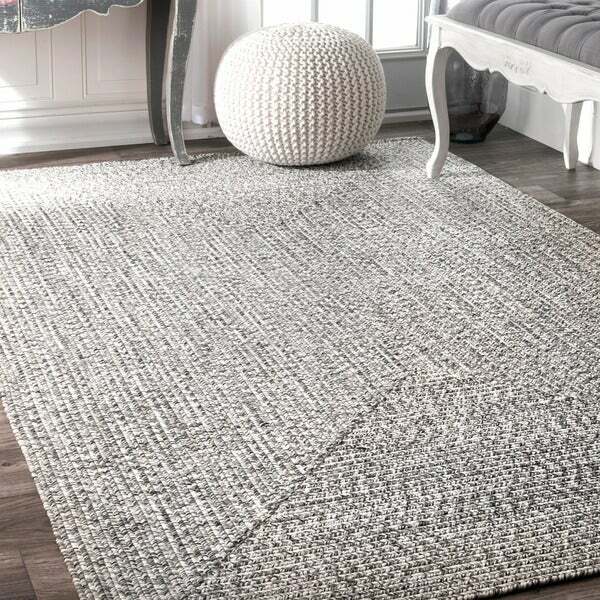 Soft and durable, the Rowan rug from Strick & Bolton is handmade from polypropylene for lasting durability. 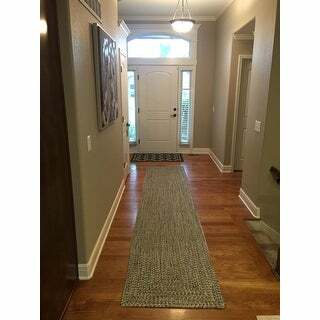 The braided fibers are ideal for busy entryways and hallways, and will pair well with nearly any decor. Dimensions 31.0 In. X 7.0 In. X 7.0 In. I love the quality of this Strick and Bolton Rowan runner! 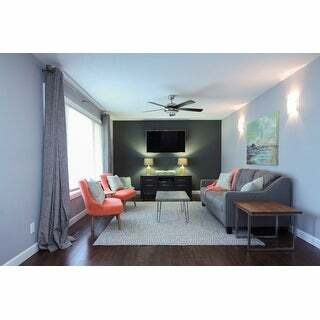 The braided area rug is a nice cool grey color. It's great for a modern or transitional design. This rug is very poor quality. I have other handmade rugs in my home and they are far better quality. I would definitely not recommend this rug. Also, it is constructed with four triangular sections sewn together which creates raised ridges as can be seen in the 2nd. pic. Overstock took 1.5 weeks to email me the return instructions. Not impressed with the product or the service. I love my new rugs! I bought the 8x10 area rug and two runners, and was a little worried they wouldn't match each other, and that one rug would have more black in it....but they all are the same neutral gray- not too blue or green- and go together perfectly. I did buy new rug anti-slip pads to go under the runners (which are in high-traffic areas) for added grip and footing when walking fast because we slipped if we weren't careful, but in all fairness, the old rug pads I had underneath were way too small. I am very pleased with them...I love how they can be dressed up or down, and look more modern or traditional depending on your furniture and accessories... The fiber isn't rough or scratchy at all... It feels good on bare feet... They are light-weight and on the thin side not like heavy wool woven rugs from back in the day, but they don't look or feel cheap. They were delivered faster then promised, were easy to carry and unroll and put in place... All in all, they were a good purchase for our family -- and for our dog who's torn 2 ACL's in the past few years and needs rugs on the floor to help him walk safely! I hope they hold up well! 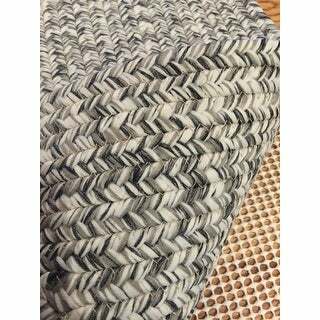 I bought this rug in the gray color. 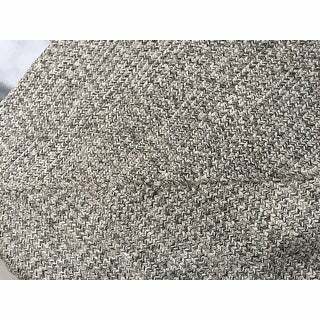 I found the same rug on the nuLOOM website and the color is listed on there as "salt and pepper" and it definitely looks more of a white/black speckled color than solid gray in person. 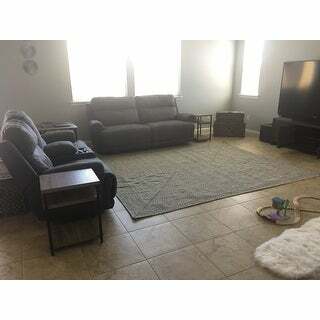 I wanted a solid gray rug, so I am returning it and ordering another rug. Customer Service was superb when I called to make the return. 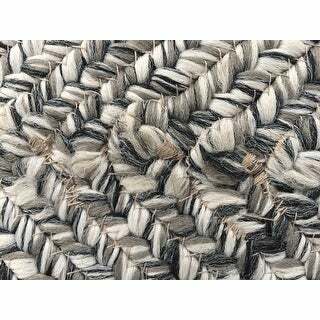 I will say that the rug seems to be of great quality, and the braided feature is pretty and adds character. 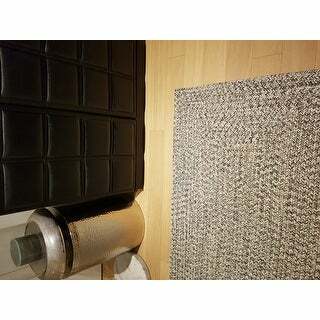 I would suggest buying the rug pad because it does move around/stretch when you walk on it. It's just not the color I had anticipated from the photo shown, so it's going back. This rug is beautiful and has tremendous value. The texture of it is perfect. The rug is a little stretchy and can bulge of stuff is slid on it, but that's to be expected with the material/weave. I get rave reviews from people who visit! Nearly 3 months since I bought it and it is holding up well, no problems from vacuuming or traffic whatsoever. If you're looking for a budget friendly rug with tons of style, this is it! The struck & Bolton rowan handmade braided area rug is an excellent addition to my living room. I used it to anchor the room. I enjoy the subtle design created by mixing black, white, and grey fibers. It's visually appealing, and not distracting. Update: I changed my rating to 5 stars because I've now been using this rug for over 2 years, even washed it out on my deck with detergent & a broom after my dog walked on it with red mud on her feet, & it still looks great! I thought I was going to have an issue with snagging, but it hasn't been a problem. Overall, it's a great rug. Highly recommend it I love the look of this rug, & I think the picture represents the color pretty well. But, I have dogs, & after only a couple of months, mine has a couple of small snags. Great rug, it is wider than most hallway rugs! I am very pleased with this braided rug. It is exactly what I have been looking for. The quality is excellent and the colors are great! Love it! The colors in this runner are perfect for my greige color scheme: white, black, grey/greige, with tan stitching. Some threads have a silvery shimmer up close-but does not look cheap at all. Runner size is wider (awesome!) than most at this price. I did need a rug pad on hardwood. Seems very durable for my high traffic entryway. Love this runner! Rug is really nice, soft under the feet. It seems like it will last a long time. The colors are white, black, grey with a bit of shimmery silver strands. 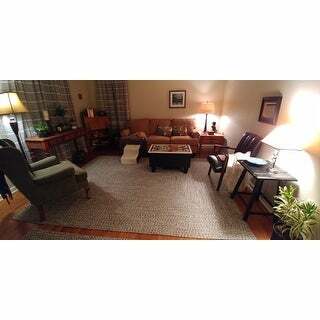 I love the rug and it looks like the picture it's just the price is not worth this quality. Just as expected. Had to buy something to keep it from slipping as it sits on hardwood. Sheds like crazy. Our home looks like we own a cat because it sheds so much. The knots in the rug are very uncomfortable to walk on. One of the knots came loose on the first day and is an eye sore. Would love to return it but I'm afraid the shipping wouldn't be worth it. We've already purchased another and replaced it. This rug is very nice. It looks modern and feels great. I wish the tassels were longer. A nice quality rug with some heft to it. I'm thinking about getting another one. Good quality rug and love that it is square. 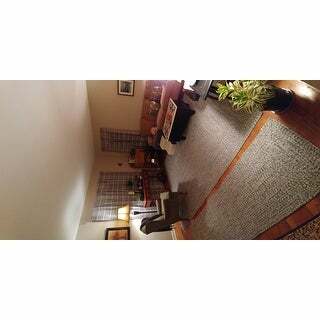 I love Overstock’s rugs I have had 100% success with every purchase. The color and quality are always spot on. 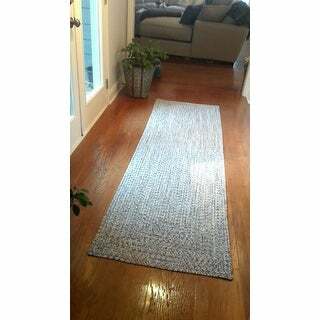 This rug was used in a hallway I love the touch it adds to our home! I love the true dark grey color if this rug. I recommend use of a rug pad if you plan to use it on wood flooring as I did. I would purchase this again! Pretty average. Color is a little darker than the image. Does slip, so you might want to spend some extra money on purchasing a non-slip rug pad. So these carpets are supposedly handmade with each "row" is sawn with thin strings, and watch out for these. The thin strings may fall apart or rip very easily. We have 2 of these and love them. Great buy! "Is the black and white (salt and pepper) rug lighter or darker? I’m putting it under a black sectional sofa and I want a lighter color so it makes it brighter. Is it more black or white?" "which color is closest to gray charcoal or salt pepper "
The Salt Pepper option is closest to light gray, Charcoal is closest to dark grey. We bought the Salt Pepper. And I got the smaller one for the bathroom. Love it! "Listed under color options is 'light blue', yet the image shown is navy blue w/white. I chatted w/an Overstock customer service rep and they couldn't tell me which color was the actual color. Help please! I want the navy/white rug but I don't want to be stuck w/return shipping fees if it turns out to be light blue." The Light Blue option is the beautiful navy/white. I hope it helps. It’s navy and white but the overall effect from a distance is a very nice light blue, not too dark and not too light. It matches my other rugs with predominant navy just fine! "Does this rug come in a 4x6? I have the runner and want to match with the same manufacturer." "Does this runner come in a 2’ 6” x 7’?" 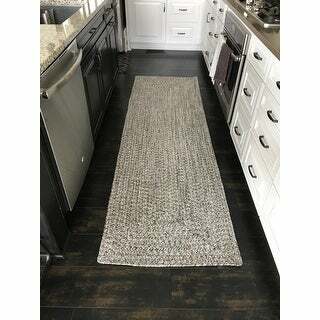 the rug I purchased like this one is gray and white and I love it. "When will the smaller sizes be available? " "The size it comes in"
This is approximately 2 feet 6 inches wide x 8 feet long.